In Major Reversal, Iraqi Kurds Offer To Freeze Their Independence Bid : The Two-Way Iraqi military forces have recently retaken control of areas held by Kurdish forces, such as the city of Kirkuk. Today's offer from the Kurdish government is not likely to defuse the crisis. 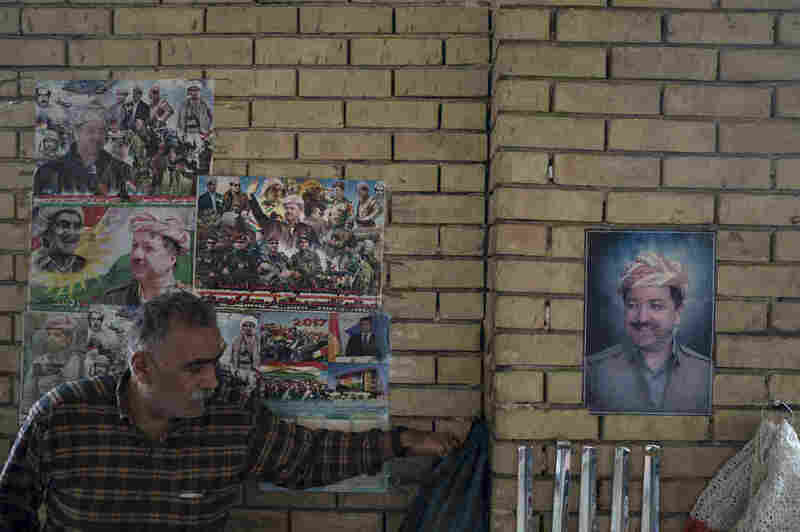 Photos of Kurdish president Masoud Barzani hang Wednesday on the walls of the central bazaar in Irbil, Iraq. In a major turnaround, the Kurdish regional government in Iraq is offering to freeze the results of last month's controversial independence referendum. The Iraqi government and other regional and international powers opposed the nonbinding vote, which was approved by a wide margin but did not take place under the supervision of international election monitors. Iraqi military forces have recently retaken control of areas held by Kurdish forces, such as the city of Kirkuk. And today's offer from the Kurdish government is not likely to defuse the crisis, NPR's Jane Arraf reports: "The Iraqi government has made clear that it will keep pushing to retake border posts and other areas previously under Kurdish control." The statement from the Kurdish regional government, published by the Kurdish news site Rudaw, essentially offers to stop pursuing independence for now. "It is a fact that a war between the two sides will not have a winner. It will instead lead both sides to great damages in all aspects of life," the statement reads. "The immediate cessation of fighting and every kind of military operations in the Kurdistan Region. "Freezing the outcome of the referendum that was held in the Iraqi Kurdistan. "Beginning an open dialogue between the Kurdistan Regional Government and the federal government on the basis of the Iraqi constitution." As Jane reports, "It's a dramatic turnaround for Kurdish president Massoud Barzani who had promised to set Kurds on the path to independence. Iraq, the United States and all of the Kurdish regions neighbors had opposed holding the vote. Kurdish parties themselves were divided on the timing of the referendum." The government of Iraq has not formally responded. A member of parliament close to Prime Minister Haider al-Abadi told the BBC that he wanted to see the Kurds annul the poll result, rather than freeze it. A freeze, he said, would constitute a "time bomb" that the region "could throw at the central government whenever it wishes." Iraq's Kurdish authorities operate autonomously. They have their own security forces, the Peshmerga, that has played a significant role in the fight against ISIS. The U.S. opposed the vote over fears that it could destabilize the region and affect the fight against ISIS militants.